Cassandra Jean is illustrating a Mortal Instruments coloring book to be released April 25! 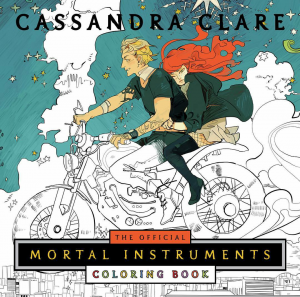 Here are a couple pictures of the coloring book that will definitely interest any Mortal Instruments fan. Coloring has proved to be very calming for many people, so what’s better than coloring your favorite book characters? 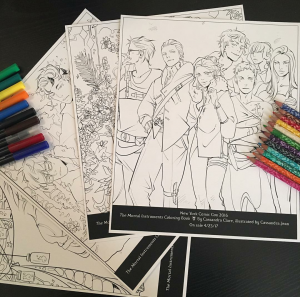 Pre-order the coloring book here! There’s not been much word on the first of The Last Hours book, Chain of Gold, but the last word was that it’s set to release sometime in the spring of 2017. Remember that this is the trilogy that centers around the children of The Infernal Devices trilogy. Here’s a snippet! This snippet focuses on Anna Lightwood, daughter of Gabriel and Cecily Lightwood, in The Last Hours, the first of which (Chain of Gold) is set to come out in 2017. Cassandra Jean has also done a drawing of Anna Lightwood I have included. This is a deleted Jalec scene from City of Glass, where Jace kisses Alec to convince him that he’s not really in love with him. If you take a look at all of the book covers for The Shadowhunter Academy, you will see they are all a piece of a bigger picture. 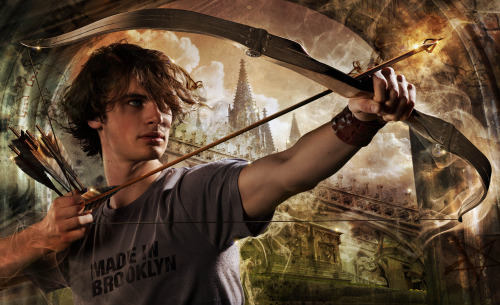 Now that all of the books have been released, the full picture has been released, and Cassandra Clare has put all of the pictures together for us!